Experience the 43rd Annual Olustee Battle Reenactment (aka Battle of Ocean Pond Reenactment) on February 15-17, 2019 at the Olustee Battlefield State Park near Sanderson, Florida. This is the famous site of Florida’s Largest Civil War Battle. The Battle of Olustee is the largest, annual Civil War event in the southeastern United States. 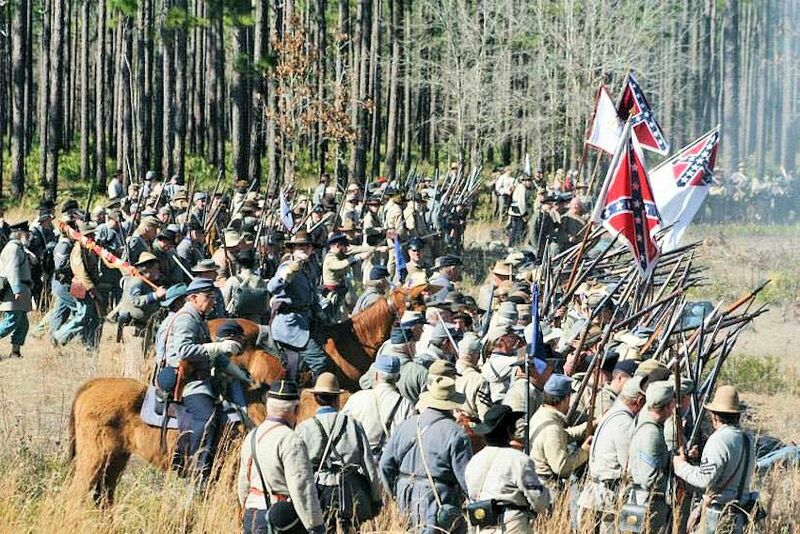 Over 2,500 Civil War reenactors (men, women and children) come to the Olustee Battlefield Historic State Park every year from all over the United States. These reenactors portray military personnel (infantry, artillery, cavalry, medical), members of the U.S. Sanitary Commission, and Civil War era civilians and sutlers. Numerous Civil War authors and historical exhibitors can be seen throughout the weekend. You can listen to almost continuous presentations under the large (9,000 square feet) tent. Plenty of seating is available. Shuttle rides are available to the Battle Site at Olustee from the Lake City Airport and Baker County Prison Center. Both sites are located on US 90 East & West of the Olustee Battle Site. Minimum bus charge is $2.00 for Adults and $1.00 for Students; Preschool children are free. 10:00 a.m. – 10:00 p.m. Early setup – EARLY SET-UP. Early registration opens. You must register and pick up parking passes and ID cards. Reenactors, Do not arrive before Thursday. You will not be allowed to set up prior to Thursday. 10:00 a.m. – 10:00 p.m. Early setup – Early registration opens. You must register and pick up parking passes and ID cards. 3:00 p.m. Safety meeting for overall commanders, safety coordinators, safety assistants, and pyrotechnician at the Ball Tent. 8:00 a.m. – 8:00 p.m. Registration. ALL PARTICIPANTS MUST REGISTER UPON ARRIVAL. Your returned preregistration forms are used only for planning. When you arrive, you must register, sign waivers, and pick up parking cards. 8:00 a.m. Back Gate (250-A) opens. 8:30 a.m. Colors on Museum/Monument Field. The day’s announcements, schedule changes, messages, etc., will be made at this time. Early arrivals are expected to attend at this time. 9:00 a.m. – 2:00 p.m. Tours and medical demonstrations for school children and groups. Anyone who can help with school children and all Medical Units are asked to assist with either 10-minute living history presentations or as group guides. 9:00 a.m. – 2:00 p.m. Educational Exhibits and Programs under the Ball tent. 9:00 a.m. – 6:00 p.m. Entertainment, arts, crafts and food booths in Lake City with opening ceremonies at noon. 8:30 p.m. – 10:30 p.m. Old Fashioned Barn Dance and dance instruction under the Ball Tent! Open to all participants. Period attire is not required. 12:00 p.m. Quiet Time – All generators off! Registration open. Front gate closed to all traffic until 5:00 p.m. Sunday. You must park outside gate to register. You will be instructed to take an alternate route to drive to your area. A map will be provided in your registration packet. You will not be admitted through alternate entrances without the proper permits. 8:00 a.m. Colors at Museum/Monument Field. Mandatory for all units. The day’s announcements, schedule changes and roll call will be made at this time. Immediately following colors: Shuttle buses to Lake City for parade will load at park entrance. A light breakfast will be provided for all parade participants in Lake City. Come to Colors prepared to board buses. 9:00 a.m. – 2:00 p.m. Authentic campsites open to the public. Please post guards and police your areas. 9:30 a.m. All horses, buggies and wagons take parade positions in Lake City. 9:45 a.m. All parade units in position in Lake City. 10:30 a.m. Parade in Lake City. Starts at Department of Transportation building, travels north on S. Marion to U.S. 90, then west on U.S. 90. Disbands near Columbia County School Board Administrative Offices. 11:00 a.m. Artillery inspection. All artillery guns and crews must be present. Participation is mandatory for each man and each piece in order to participate in firing activities during any part of the event. 11:00 a.m. Presentation under the Ball Tent: The Service of “People of Color” in the Civil War. 12:00 p.m. Period music concert at demonstration area. 1:00 p.m. Medical demonstration for the public at the Medical tent. All medical units are invited to participate. 2:30 p.m. Period music concert at the Battlefield. 3:00 p.m. Pyrotechnics field orientation for reenactors. 3:30 p.m. Battle reenactment begins on the battlefield. 8:00 p.m. – 11:30 p.m. Battle of Olustee Ball at the Ball Tent. Period attire required. Participants only. 12:00 p.m. Quiet Time. All generators off! 8:00 a.m. – 11:00 a.m. Registration closes at 11:00 a.m.
8:30 a.m. Colors on Museum/Monument Grounds. Mandatory for all units. The day’s announcements. schedule changes and roll call will be made at this time. Streamers will be given out by groups at this time. 9:00 a.m. Union Monument Ceremony. Those wishing to march after colors to the Union Monument for the annual observance are invited to join in. 9:00 a.m. – 12:00 p.m. Authentic campsites open to the public. Please post guards and police your areas. 9:00 a.m. – 9:45 a.m. Medical demonstration at the Medical tent. All medical units are invited to participate. 9:30 a.m. Artillery Units. Stipends issued to gun owners at Artillery Camp headquarters. 9:30 a.m. – 12:00 p.m. Cavalry drill coordination. Pyrotechnics orientation for reenactors. 10:00 a.m. – 11:00 a.m. Period church services in Authentic Camps and under the Ball Tent. 12:30 p.m. – 1:30 p.m. Period music concert at the Battlefield. 12:45 p.m. All units form up on Battlefield at assigned positions. 1:00 p.m. Safety inspection. Mandatory for all participants. 2:45 p.m. Formal retreat for Final Volley and Thanks. 3:00 p.m. Reenactors, sulters and exhibitors wishing to spend the night may stay until Monday. Exit through back gates only until 5:00 p.m.
5:00 p.m. All gates open for reenactors to exit. Parking: Beginning in 2019, public parking is NOT allowed along US 90, at or close to the battlefield, with the exception of persons with a disability placard. FREE bus shuttle service is provided from the Dowling Center, 1.5 miles EAST of the Battlefield on U.S. 90, directly across from the Baker County Correctional Institutional. No shuttle buses will operate west of the Battlefield. Stay another day and come back next year! Reenactors, sulters and other exhibitors wishing to spend the night after the Olustee Battle Reenactment may stay until Monday. Camps: While a number of the Olustee Battle Reenactment participants camp in the modern area, most camp in Civil War style—from tents in all sizes and styles to campaign (no tents and just what they can carry on their backs). The camps are everywhere. Many are strictly military, others are civilian and still others are combined. Visitors/spectators are encouraged to visit the authentic camps, wander among the campfires, listen to the soldiers and civilians and ask questions. While you should not wander through the modern reenactor camps, you are welcome to visit the authentic Federal (Union) infantry and civilian camps, the combined Federal and Confederate cavalry and artillery camps, and the Confederate infantry and civilian camps. Sutlers are Civil War-era merchants. During the Civil War every regiment or brigade had a sutler licensed to follow along and sell “extras” to the men. These extras included food items, such as cans of sweetened condensed milk (a favorite with the men); to clothing, such as civilian-style shirts; to some items hidden away from the eyes of the Provost (military police). Olustee usually has 40-50 sutlers in attendance and these sutlers must pass inspection for the authenticity of their goods and appearance. Friday is the day when thousands of students invade the site with their teachers and parents to learn more about the Civil War. There are medical, cavalry, artillery and infantry demonstrations. Some students are here just to roam, talk to the reenactors and absorb history. Others have definite history assignments they are working on, everything from books to audio and photographic projects. If you wish your child to attend, ask your school to contact the Florida Park Service at (386) 397-2733 or e-mail olusteecso@yahoo.com. Many home-schoolers bring their children to Olustee to absorb this period of our history. 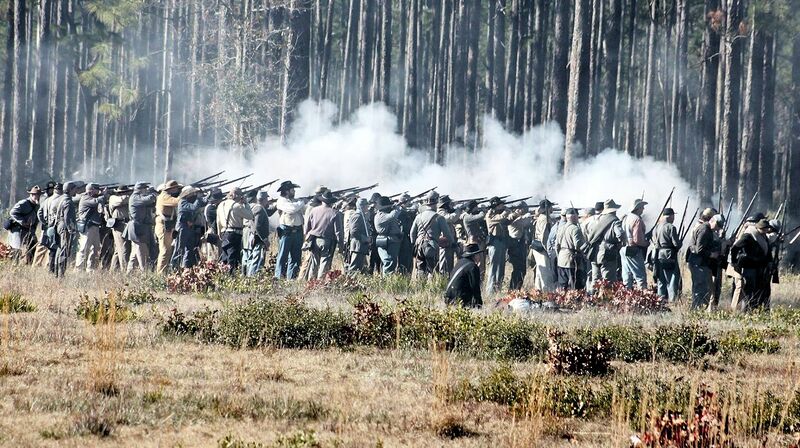 Unless you must witness the scripted Olustee Battle Reenactment, Saturday is the best day for spectators. 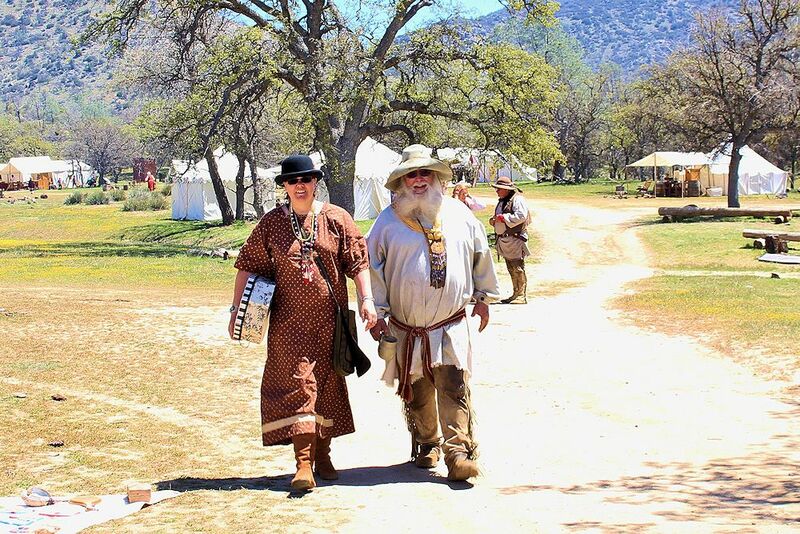 Not only do you have most of the day to visit the authentic camps and sutler area, but the full-scale Saturday battle is not until 3:30 pm (or 2 hours later than on Sunday). In addition, the crowds will be smaller than on Sunday. And after the battle, why rush to wait in the lines at the bus pickup points when you can take your time ambling through the camps watching the reenactors rest up and clean their weapons after fighting and dying. After dinner, many of the reenactors will be putting on their dress uniforms and gowns for the Reenactor’s Ball later that evening. The Ball is not open to the spectators and you will have left the event site long before it begins. Other reenactors will spend the evening campfire visiting, telling tales of other events, discussing the Civil War and just visiting with friends. The “sense of community” is strong among reenactors and many of us don’t see each other except for these events, as our homes are distant from one another. But friendships are strong and campfire visits are the best time to meet with comrades: when officers and enlisted men, from ditch diggers to bank presidents and even, of all things, entomologists, share the warmth of the fire and a drink from a canteen (or other liquid containers). Even before the troops begin to assemble for Sunday’s Olustee Battle Reenactment, many of them will take down their tents and pack their belongings. We all have a long drive home—especially those from the northern states—and after the battle we will be scattering to the four winds. If you do not arrive early on Sunday then you should visit the camps before the battle. After the battle, when the troops are breaking camp, is the best time to visit the sutlers who usually stay until Monday. And when you have finished there, the bus lines will be much shorter for the ride back to your car. Why is it Important to Register at the Battle of Olustee? Links to all details for Reenactors, Vendors, Visitors, etc. Mark your calendar today you don’t miss the next Olustee Battle Reenactment at the Olustee Battlefield State Park near Sanderson, Florida.